The first time I saw Caladium bicolor (Rubicundum) it was growing in a plant display stream at Selby Botanical Gardens. The plant was 6 feet tall with 2 foot leaves. The leaves were dark green with purple veins and bright pink. I immediately wanted this plant but none were available at the gardens. Dewey Fisk informed me it was collected many years ago in the center of a small village in South America. The village grew it in the center of the village in a landscape display. The collector who was visiting the village could not help himself and took a piece of the plant and brought it back to the states. 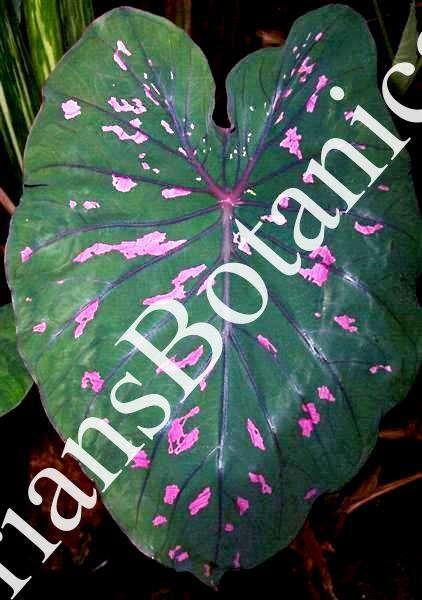 Caladium bicolor (Rubicundum) is an easy Caladium to grow to 1 to 3 feet tall. If you want to grow this Caladium to 3+ feet it will need to be grown with wet feet in a very warm and humid situation.